The BODY is made of top-quality brass with PVD-finishing. FAUCET STEM for filtered water. Plastic TANK storages up to 500 ML. The original shade and design of the dispensers perfectly fits to sinks and taps produced by OMOIKIRI brand. Does not contain microcracks, serves as the abrasion- and scratch-resistant protection layer. Japanese high-quality chromenickel stainless steel. Sink body is treated with special noise-reducing composition and additional rubber pads on all 5 sides of the bowl . translated from Japanese OMOIKIRI means "decisive". This brand produces a wide range of high-quality kitchen sinks and stylish mixers of premium class that can decorate the interior of every kitchen and give it a unique, individual character. All the products of the brand are distinguished by their exclusive design, high manufacturing quality, reliability and ease of use. The possibility of connecting water filter. Aerator is made of special polymer material therefore it will be injured neither by lime scale nor by rust. The taps handles are decorated with Swarovski crystals. Classic model made from high quality brass with pull-out hose. The tap is easy-to-use and is protected from rust and lime scale. Unique patented design with a flexible hose and the ability to supply filtered water through a separate tube. This is a perfect tap for washing large kitchen items and filling large containers. Exclusive patented designs "stones" and "silk". Tap made from high-quality brass with flexible connection in stainless steel braiding. A real highlight of any kitchen interior. Stylish kitchen sink made from natural copper, which has antibacterial properties. The model is able to give the kitchen interior individuality and respectability. 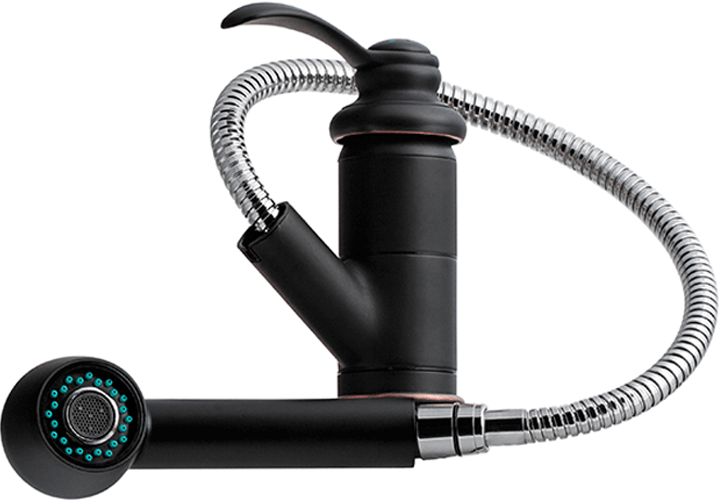 Unique patented design with a flexible hose and the ability to supply filtered water through a separate tube. The tap is ideal for washing large kitchen items and filling large containers. Wear-resistant, durable and eco-friendly sink from high-tech material ARTGRANIT, resistant both to temperature changes and mechanical damage - bumps and scratches. Kitchen sink made from stainless steel with PVD-coating. Extremely functional, convenient and reliable. The body of sink has noise-canceling coating and five-sides rubber pads. Kitchen sink from stainless steel with the body polished with noise-suppressing compound and equipped with five rubber pads. All models of OMOIKIRI kitchen sinks and taps are specially treated and covered with a unique protective layer of CRYSTAL SHINE, which reduces the formation of plaque from water and dirt on the surface.